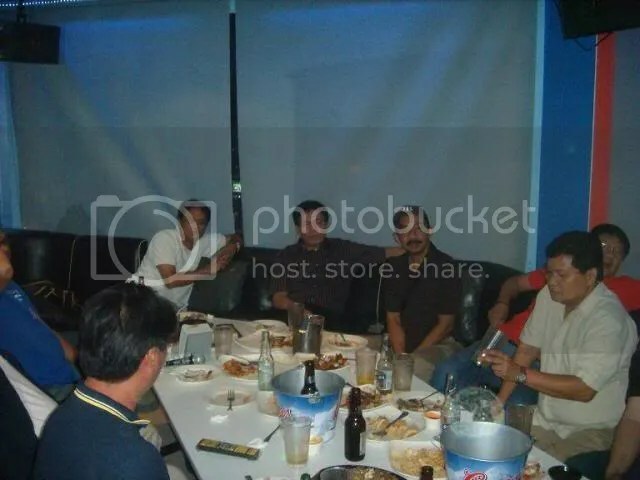 The group really had fun during the Karaoke Night but it seems, 5 hours was not enough to satiate the hunger of the group to bond with NM Iskubadayb and GM Genius. Since Master Isku will return to the Land of Milk and Honey by 1st week of July, an activity has to be set in order to have some additional face time with the Master. Phones started ringing trying to arrange a schedule and a venue that is acceptable to everyone. It was Master Isku himself who suggested that the venue could be a resort so that everyone can relax and unwind. So the group agreed to go to Batis ng Makiling on Saturday, June 30. 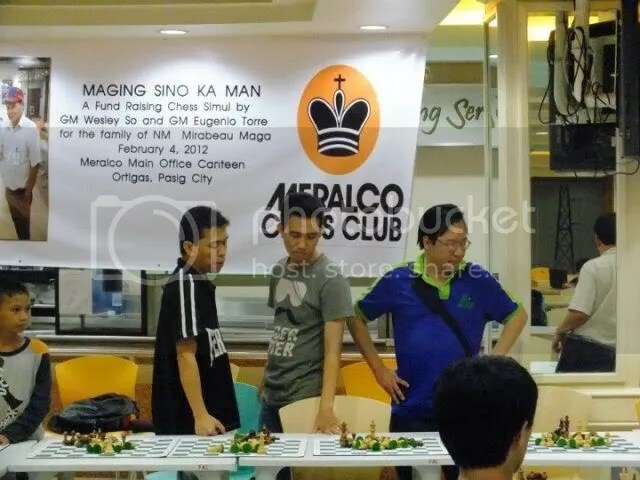 Regge Tee, Dari Castro, wordfunph, pulsar, nanobrain, sheriff, epistle, allan d, pinoymaster77 and of course Master Isku confirmed that they will join. Everyone got even more excited when GM Eugene texted Friday evening that he will join us. 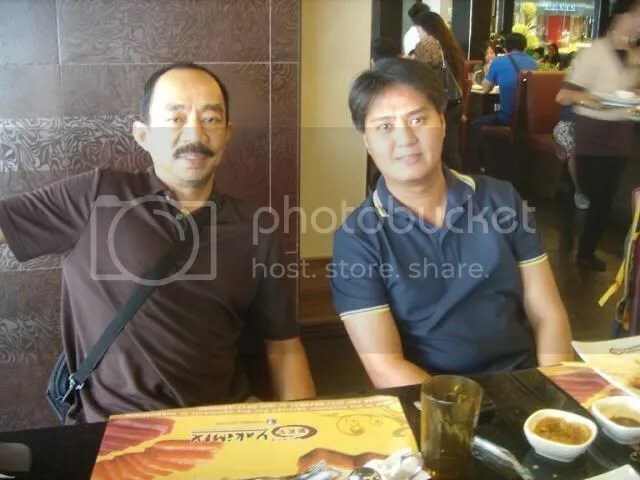 Wordfunph and Allan D said that they will go straight to the venue while nanobrain and sheriff will wait for us (GM Eugene, Master Isku, pulsar, epistle, spawn2) at Shell SLEX where we will have our breakfast. 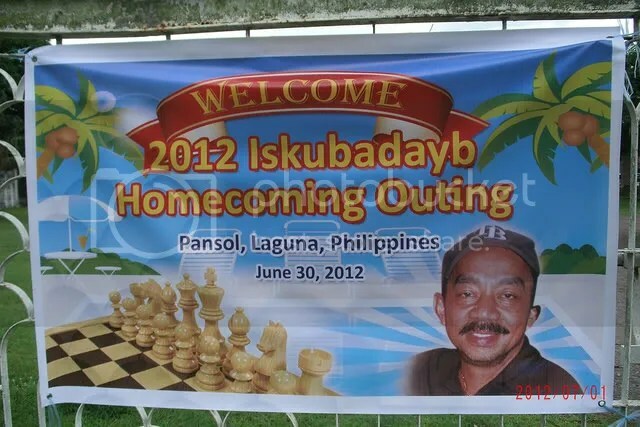 By 9:30 am, we were already entering the compound of Batis ng Makiling where a banner welcoming the arrival of Master isku is prominently displayed at the entrance (courtesy of wordfunph and allan d). We were kidding Master Isku and started calling him “Mayor” because the banner resembles the tarpaulin local groups put up to welcome an important personality in their town. 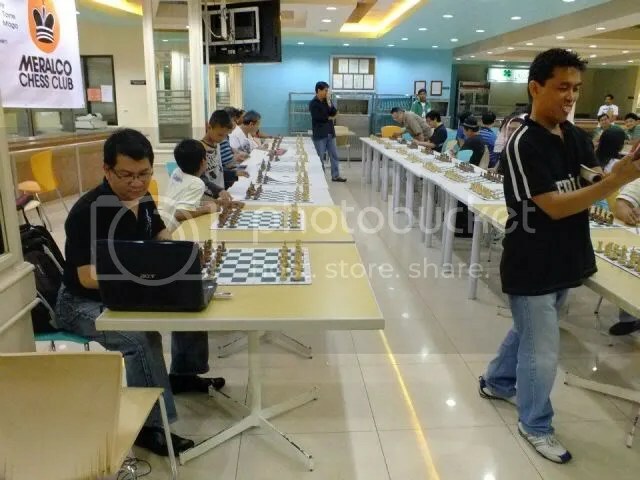 When we arrived at our designated hut, chess boards and pieces were already set-up and nanobrain and sheriff who arrived ahead of us (I made a wrong turn which added 15 minutes to our travel time) were already engaged in cerebral battle that started in Jollibee SLEX. We rested and surveyed the resort which boast a very huge swimming pool and 2 smaller pools (hot spring). Aside from the cottage, we were also provided with a room (nice and comfy) where we can change. After 30 minutes of joking and bantering, its time to hit the waters. 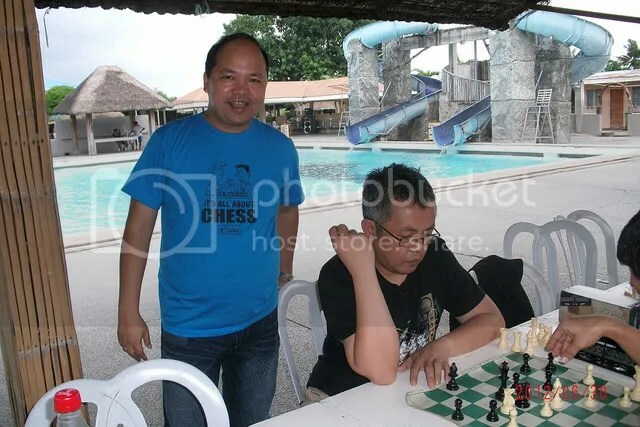 GM Eugene went straight to the smaller pool while Master Isku, pulsar, wordfunph and I went to the bigger pool. Water was cold but the sun was doing a good job in reducing the impact of the cold water to our tired bodies. We were looking at wordfunph and it looks like he will execute a butterfly stroke but stopped before completing it..butterfly ba or butterdog stroke (combination of butterfly and langoy aso hehehe) After a few laps, its time to try the hot spring. We discovered another talent or you can call it skill that GM Eugene has. As we swapped stories, NM Isku remembered that GM Eugene has this uncanny ability to hold his breath under water for a long time. I did not pay much attention to this because I during my younger years can stay under water for 1 min and 20 seconds ( I used to time myself submerging my head in an Orocan full of water in our bathroom). 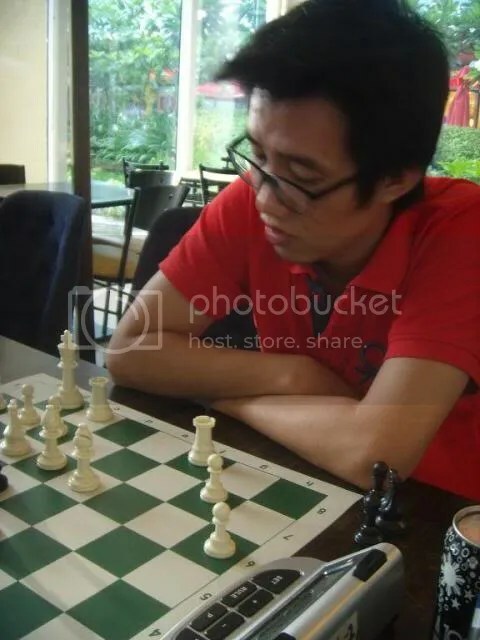 GM Eugene started the test with NM Isku using his watch to determine the time..it was 2 minutes and 43 seconds! under water. A little more practice and am sure he can reach 3 minutes! After getting enough heat from the hot spring, its time to go back to the big pool. But since its already 11:00 am we only stayed there for around 20 minutes. 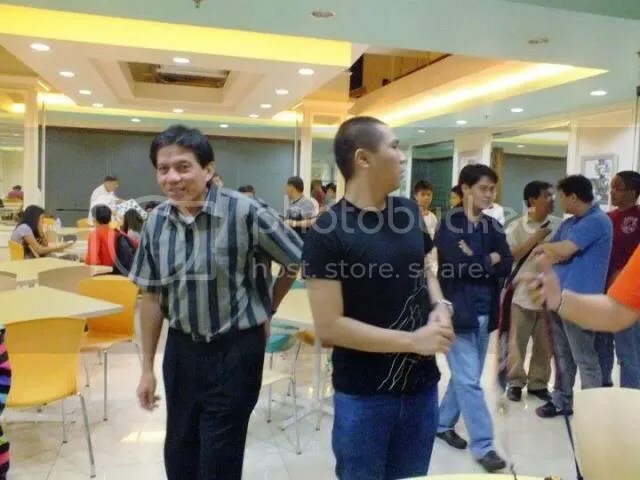 By that time, regge, dari, edwin llamo and another guy (I failed to get his name) arrived which prompted us to prepare for lunch. It was agreed that lunch will be taken outside so that no one will be inconvenience in bringing food to the resort. 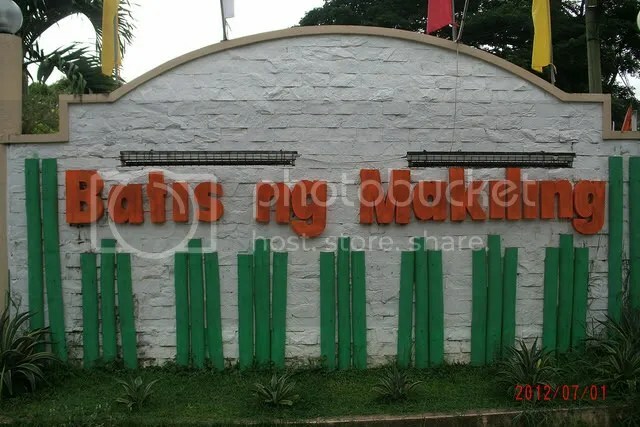 Allan D who was familiar with the area suggested Aling Ely’s (tama ba allan d?) which is around 2 to 3 kms from the resort. 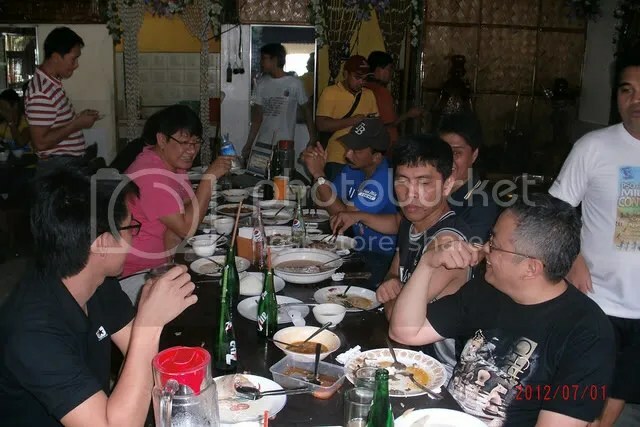 Immediately after arriving at the venue the group ordered for seafood fare(Sinigang na Ulo ng Isda, Paksiw na Bangus, Buttered Prawn). There was also Kare Kare just to break the seafood monotony. There were lechons being cooked but those were already spoken for. While eating, GM Eugene, regge and Edwin watched an HBO documentary on Bobby Fischer where GM Eugene was interviewed for his thought on the Chess Legend. After the healthy lunch, we went back to the resort for an afternoon of chess games and chess analysis. GM Eugene brought 2 chess books on chess problems and puzzles which he said he purchased in Khanty–Mansiysk during the last Olympiad if my recollection is correct. Judging by the cover of the books which were bright and colorful, you can mistake it for chess books intended for children. After browsing the content of the books and seeing how difficult the problems you need to solve, pulsar commented “if these are the type of books being given to Russian children, then we dont have any chance. 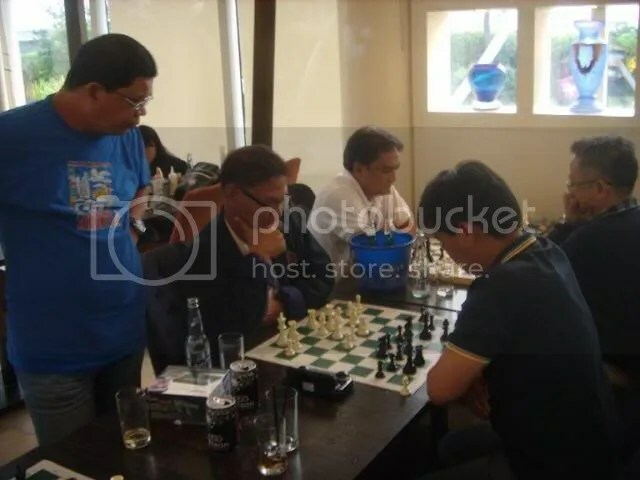 It was a delight seeing GM Eugene and NM Bernie collaborating to answer the difficult chess problems. 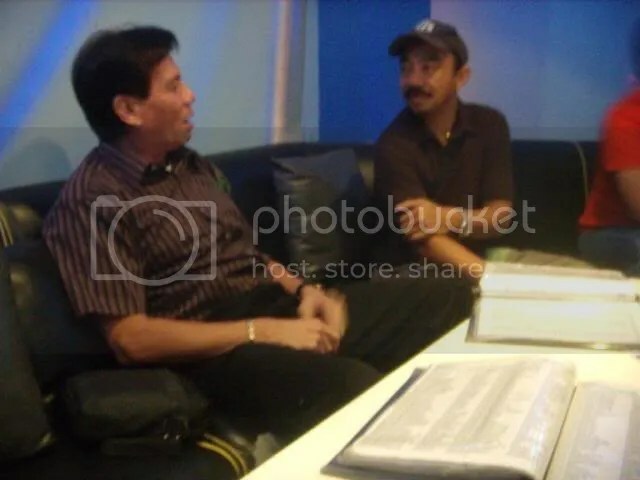 We were transported back in time to 1983 when the two joined forces together with IM Rico Mascarinas to prepare GM Eugene for the Candidates. Prior to that, they have also trained together for the 1984 Olympiad where NM Bernie terrorized his opponents. Batman and Robin..Green Hornet and Kato in action once again! Our resident Master, pulsar and computer whiz Edwin were also helping the two titled players. 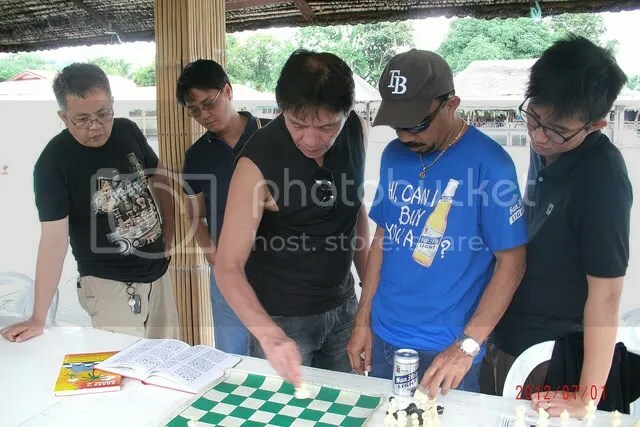 While the two were busy solving chess puzzles, allan d and epistle were lock in mortal combat on the 64 checkered board. 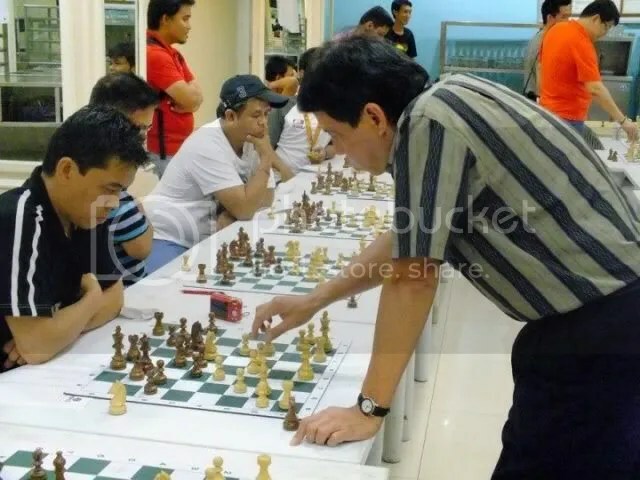 Allan D beat Epistle in one game and you can see the jubilation of allan. I believe Epi has allan’s number until that game when allan emerged triumphant. 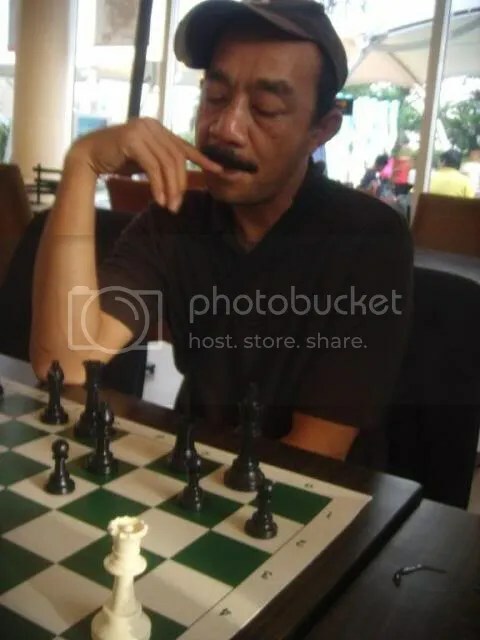 We told epistle that he played a souped up allan d who had the opportunity to swim in the pool with GM Eugene which could be the reason for the strong moves. : ) Nanobrain, sheriff also played while Regge, Dari and Vincent watched. Same goes with pm77 who from time to time captured the actions with his trusted camera. Time flew so fast we did not notice that its already 5:00 pm. The group were about to leave but a heavy downpour prevented us from leaving the cottage which gave us an additional 30 minutes of “kwentuhan”. Dari was right, the group “BW-GETS” is already solid and established and these activities will have to continue to further cement the friendship amongst the members. Thank you very much <GM Eugene and NM Bernie> for mixing it up with us mortals. Another memorable experience we will treasure for a very long time. 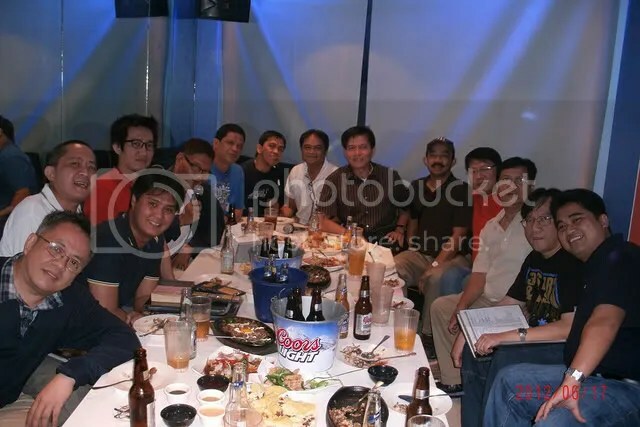 To <nanobrain> who arranged for the venue, <sheriff> who even though he was not feeling well went out of his way to attend, <pulsar> who should have stayed in his new house but made an effort to join the team, <epistle> who has always been supportive of BW GETS activity, <pinoymaster77>, our resident selfless photographer, <Regge, Dari, Edwin and Vincent> who took time out from their hectic sched to be with the group, <allan d> who brought snacks and his bagful of trivias and <wordfunph> who prepared the banner for Mayor Isku..maraming maraming salamat po! R & R with the Legends was a success because of team effort! were with us in spirit! 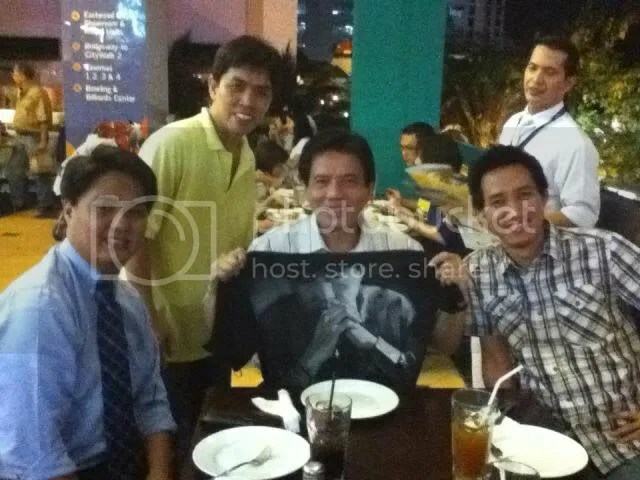 Around 2 years ago, Philippine’s Chess Living Legend was kind enough to meet with three fans for dinner and swapping of chess updates. 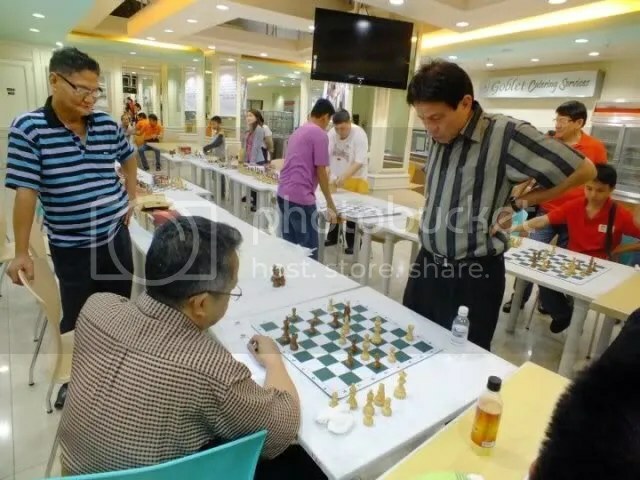 That first time became a tradition and almost every quarter, Asia’s First Grandmaster and GETS (Grandmaster Eugene Torre Supporters) will meet. After our last dinner in April (which happens to be the anniversary of the first meeting) we decided to introduce a “Novelty”. 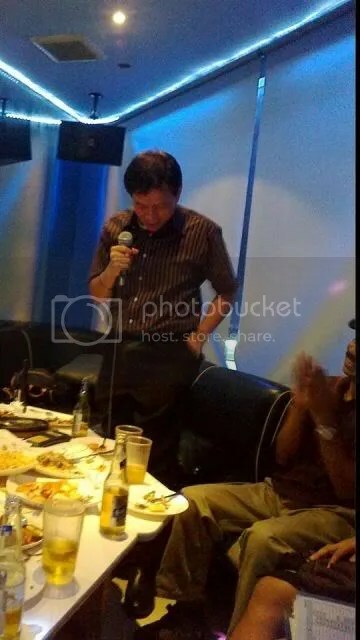 Instead of the regular dinner, why not go to a Family KTV to sing the night away. AFGM sings well and others in the group also sings well while some of us well, we sing so it was not really difficult to see the TN move. So the ball started rolling, text and email messages were sent and received to iron out the details. 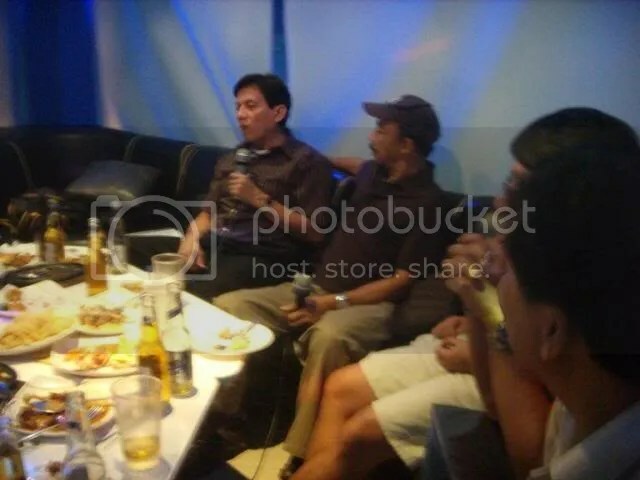 Karaoke Night was set in June 16, 2012 at Music 21! 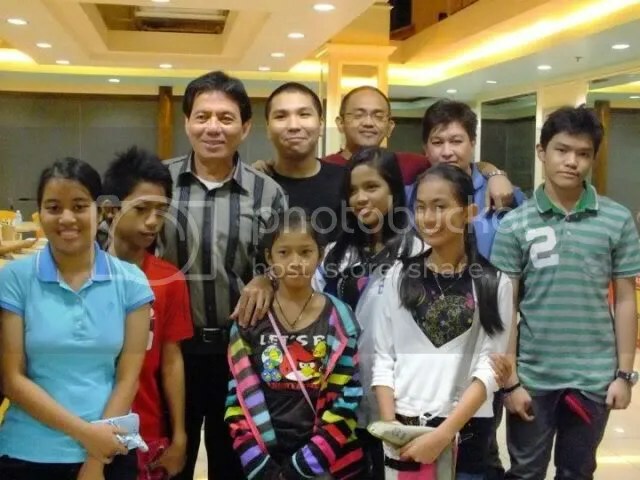 Fast forward to June 16, 2012. Everybody is excited. 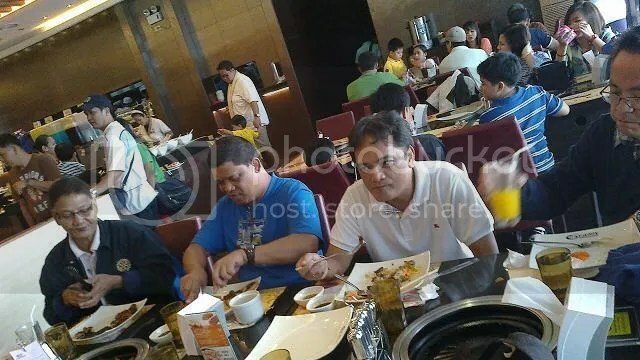 Call time was set at 7:00 pm but nanobrain introduced a deviation from the main schedule and invited everyone to lunch at SM North Edsa. Site of the congragation is at Yakimix at 12 nn. He is there together with sheriff to meet a client. I texted the gang and Nf3em, epistle and pulsar replied that they will go. Atty. Roy is also on the way while me, I need to pick-up Master Isku at his residence. This is one of the things that made the Karaoke Night truly exciting. 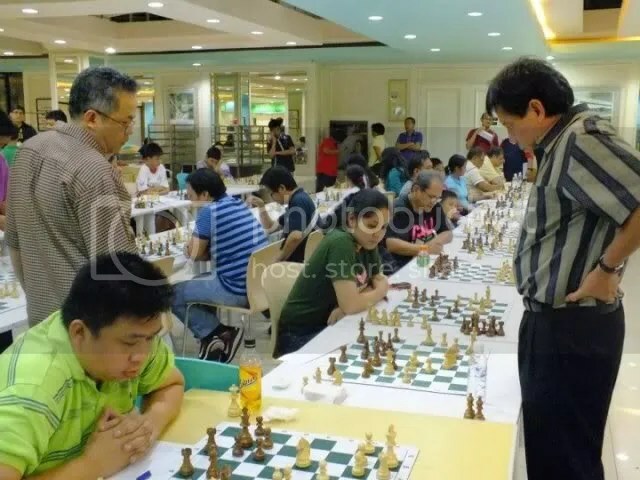 Master Isku who is now residing in the U.S. was one of GM Eugene’s support during his Candidates campaign in Alicante, Spain. He also represented the country twice in the Olympiad. 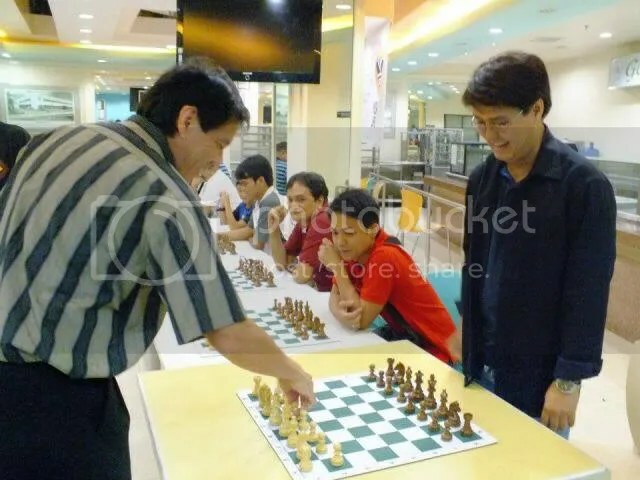 According to Master Isku, its been 23 years since he last saw GM Torre! 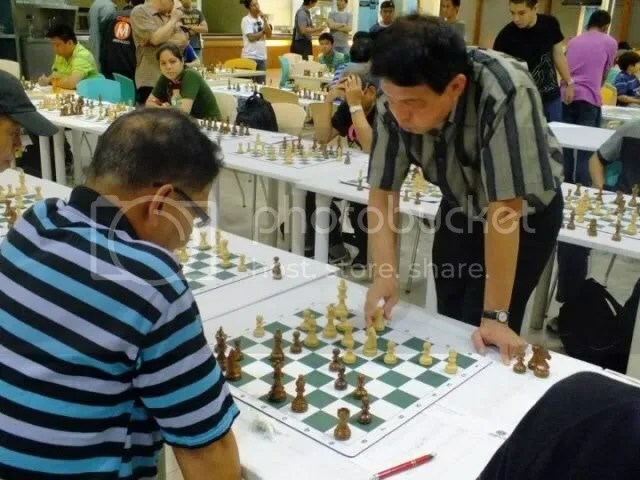 We withheld the information to GM Eugene that Master Isku is here in the Philippines. 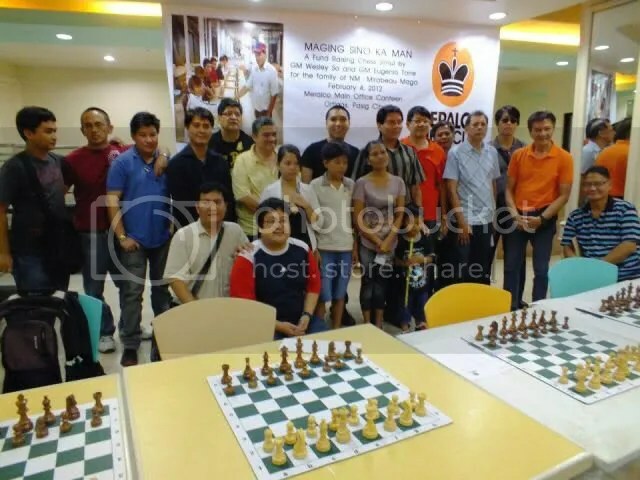 After the sumptuous lunch, we went looking for a place where we can play some chess. We landed at Persian Kebab and we were allowed to commandeer three tables for our playing pleasure. We started at around 3 pm and blitz our way until 6 pm. The time flew so fast that we did not notice its time to go the venue. 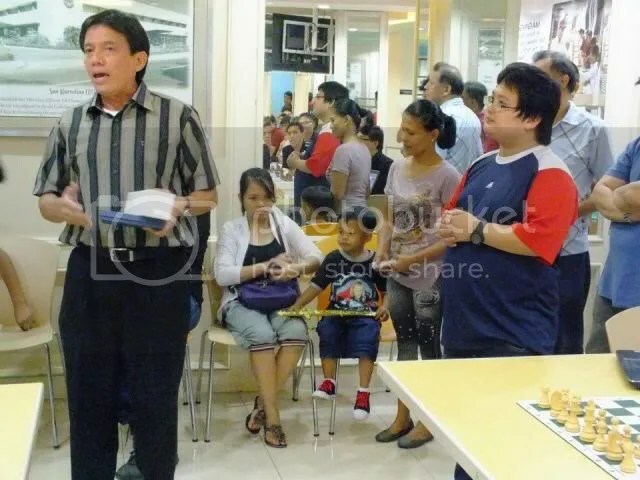 If there is an early bird award, that will go to Morphyeus of Cavite who was at the venue by 5:30 pm. From SM North Edsa, 3 cars left at around 6:20 pm. Epistle with Atty Roy, Sheriff and pulsar with nanobrain , Nf3em and Master Isku with me. We arrived at 7 pm in the venue and GM Eugene was already there sitting comfortably at Rm 13 on the 2nd floor. He said that his meeting finished early which allowed him to go to the venue right away. GM Eugene was really surprised. He said the dark shades and the cap made it difficult for him to recognize Mr. Bernie right away. They immediately swap stories, the 23 years of not seeing each other did not make any dent on their friendship. No awkward moments, they immediately warmed up to each other. The attendees started pouring in. 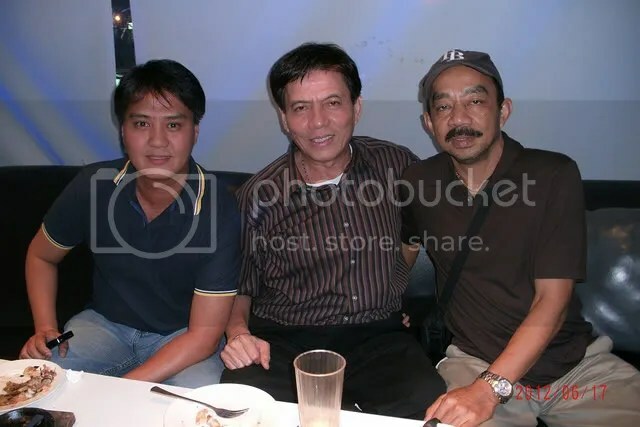 Mr. Regge Tee, wordfunph and allan d from faraway Laguna and life of the party Dari Castro. We missed Master Glenn pinoymaster77 and kardopov. I need to mention Nf3em who traveled for 3 hours from Batangas just to be with the group. He will leave for Singapore this coming Tuesday. Mr. Llamo of Bacolod or was it Iloilo arrived latter part of the evening. Everyone are sitted, food is on the table, microphone and sound system were checked..its time to blast the night with music! 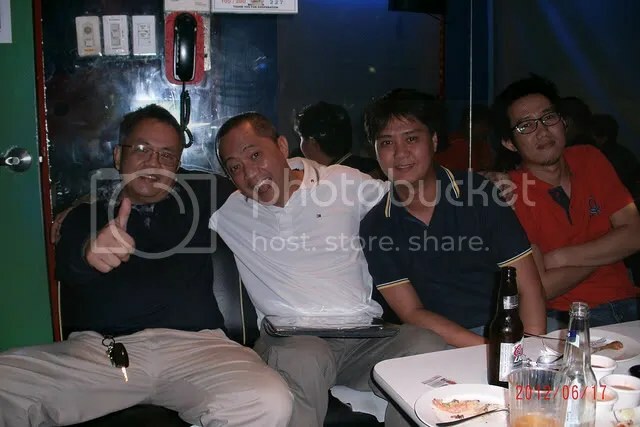 GM Eugene, Atty. 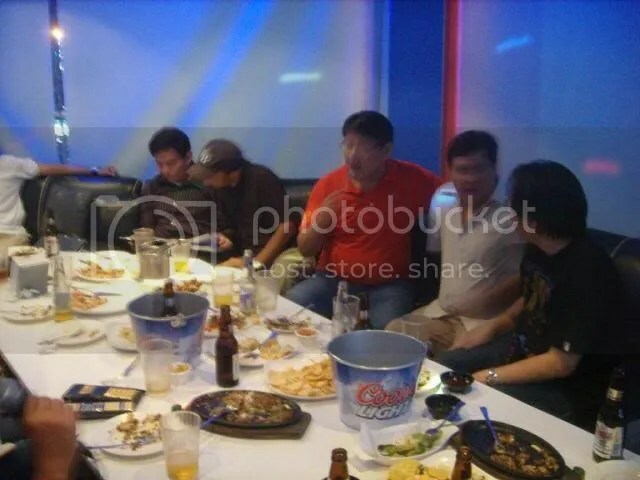 Roy, Morphyeus, sheriff, Nf3em, pulsar, epistle, allan d, spawn2, Master Isku and wordfunph took turns. Not so sure if our combined vocal repertoire was the reason Typhoon Butchoy decided not to make landfall. Regge Tee, nanobrain and Mr. Llamo decided to just watch in the sidelines while Dari confessed that he is more of a dancer rather than a singer. It was suppose to end at 11 pm but since everyone was having such a good time, we decided to extend our stay by another hour. 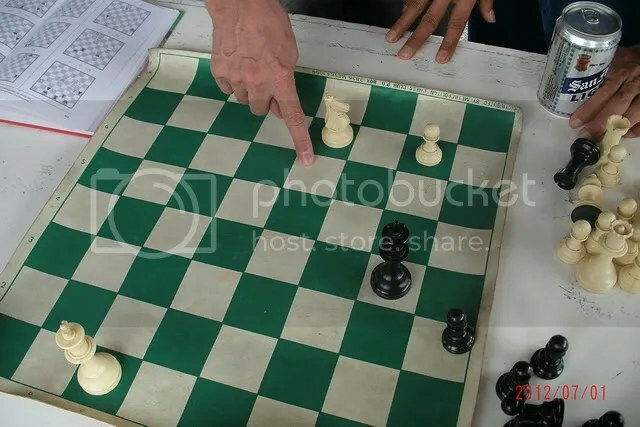 The last 45 minutes was used to discuss chess and its impact on the lives of those playing it and how the learning you derived from the game can be use for the betterment of one’s life. Once again, the evening is about to end and everyone is tired but still smiling. Good food, good music with good friends, how can you beat that! GM Eugene was the first to leave and the others followed afterwards. Another memorable night with memorable people. As they say, Chess and Music can definitely make people happy. 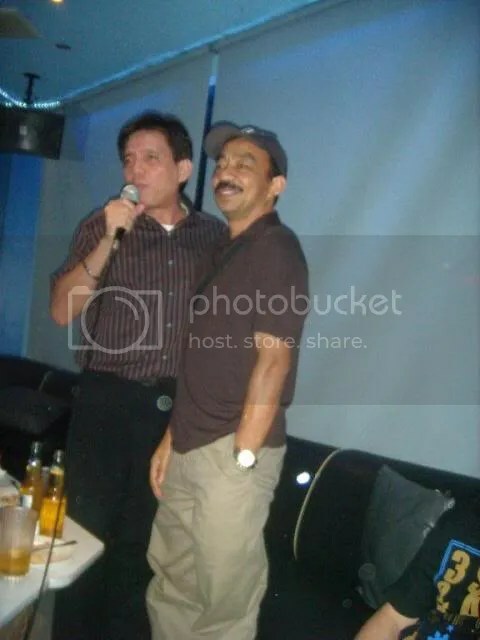 Salamat po sa mga naging bahagi ng Karaoke Night. Much thanks for the Pics ka- BW/GETS official photographer pinoymaster77 !! !